On the front, there is the Alcatel logo with five indicators for power, WiFi, telephone, network, and signal. The power button is on one edge side while the opposite side locates the power plug, one USB port, two Ethernet ports(one RJ45 for LAN/WAN and the other for LAN only), one RJ11 telephone port and two connectors for LTE antennas which are covered by two round cap. The antenna connector type is SMA-female. If you would like to buy the external LTE antenna for Alcatel Linkhub HH70, you’d better buy the external antenna with SMA-male connectors. The WPS button is at another side. The Reset button and SIM card are hidden under a cover. The SIM card slot is for NANO-SIM card size. Upgrading from the Alcatel Linkhub HH40, Linkhub HH70 supports LTE cat7 which could achieve download speed up to 300Mbps and upload speed to 100Mbps based on Qualcomm MDM9240 chipset and 2CA carrier aggregation technology. 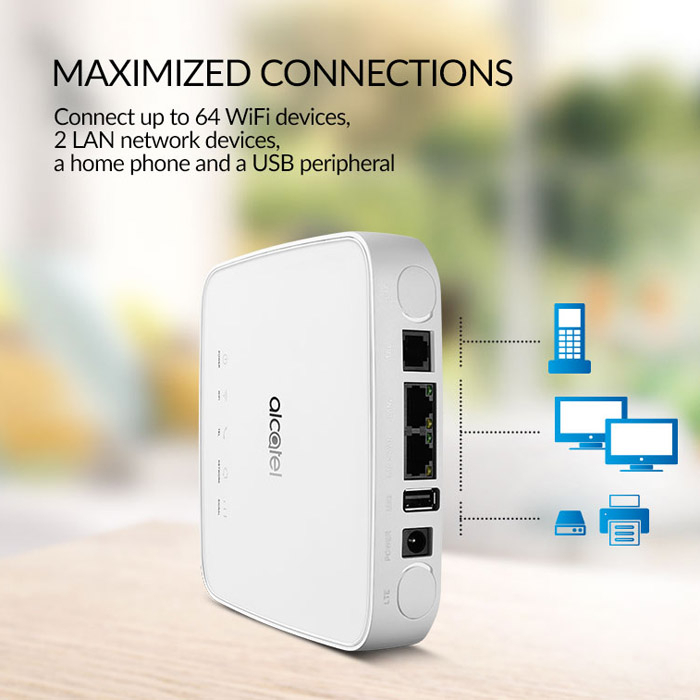 And Linkhub Cat7 HH70 supports maximum WiFi users up to 64 devices while the HH40 supports only half to 32 devices. Alcatel HH70 Linkhub provides WiFi 802.11 a/b/g/n/ac on dual-band while the HH40 missing the 802.11 ac and only on single band 2.4GHz. The WiFi could cover around 250 meters, which is very strong. The management and control of the Linkhub HH70 could be done via the Alcatel WiFi Link APP, which could also be used with Alcatel Linkhub HH40. However, there is no integrated battery for mobile use in the Alcatel Linkhub HH70, but you can still operate the router via a corresponding power supply, for example, in the motorhome, in the car or in the house.